Now as far as my experience in mountain biking goes large numbers of us tends to mean an awful lot of faffing, however upon arrival in the Cafe we were met by Amanda and Emily armed with folder each containing all the information we could possibly need plus a wrist band to remind us of our group and coaching time, this was obviously going to be a slick operation and no woman was going to be left behind! 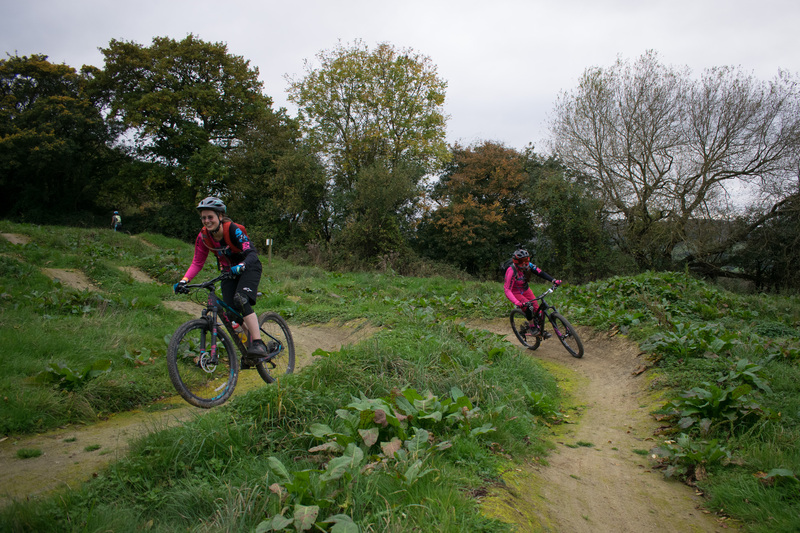 At first the feeling of trepidation swept through the Swindon ranks as we realised that no two members were in the same coaching group but careful planning had matched us to ride with other ladies on the same wavelength meaning the coaching could run smoothly. 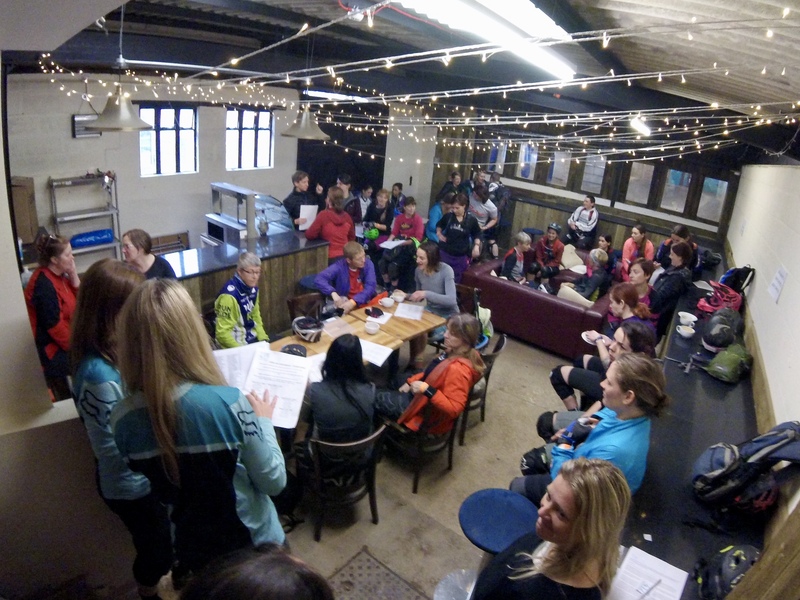 After an initial welcome briefing I headed out for my coaching session whilst other ladies set off either in their group or to session the track with Amanda and Emily. The coaching its self was group specific with everyone tackling areas they felt they wanted to work on. My group coached by the lovely Tom spent our time working on correct technique for carrying speed through corners and jumping tabletops. Tom eloquently explained and demonstrated the techniques then watching each rider and feeding back where he felt we needed to focus meaning that all of the ladies came away with a much clearer knowledge of technique and a huge grin from performing way above their previous level. 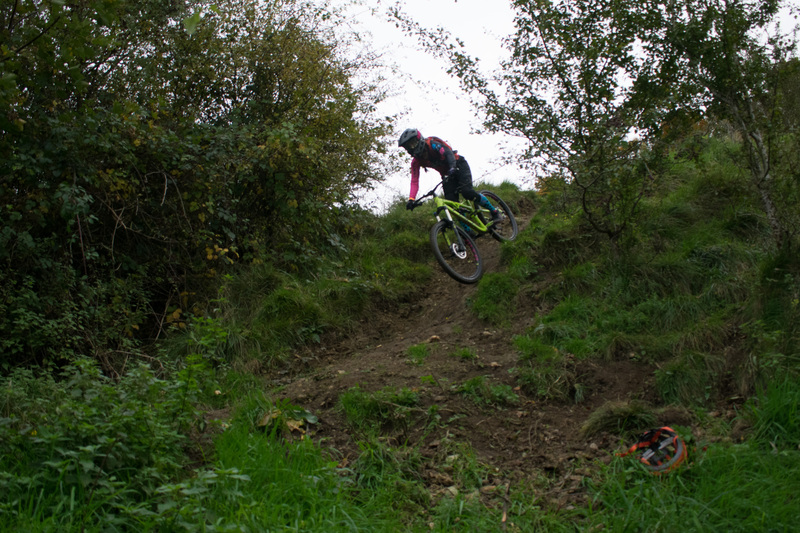 After our session was up it was time to head back to the cafe for group change over and then on to the uplift ready to session the track. At this point we were given the riding options of Blue, Red without the chute or Full Red and the group split up. I headed up with leader Emily and the other brave souls that dared the full red, a train was formed and after some tight corners we slowed to allow each lady to descend what was more of a steep rocky bank than a tight chute. With a whoop and a cheer everyone sailed down rejoining those who had skipped the top section and we continued down the red. Emily’s guidance over sections as she carefully navigated us down what is the most confusing red line ever was total perfection as she ensured every lady under her lead reached the bottom safely with a huge grin. By 1pm the hunger pangs had set in and everyone headed to the cafe for their lunch which fantastically was included in the cost of the day (£25) The food at Fly up is very good quality with options available for those with gluten and dairy intolerances so you really can’t complain that they don’t cater for all. Feeling rather full we then ventured into the barns for a quick go on the pump track only to be shown up by a tiny gang of children who obviously rule the roost around these parts. We hastily decided upon retreat and headed for another uplift, somehow the back of the Landrover felt more snug after our burger and chips but at least I wasn’t pushing up. 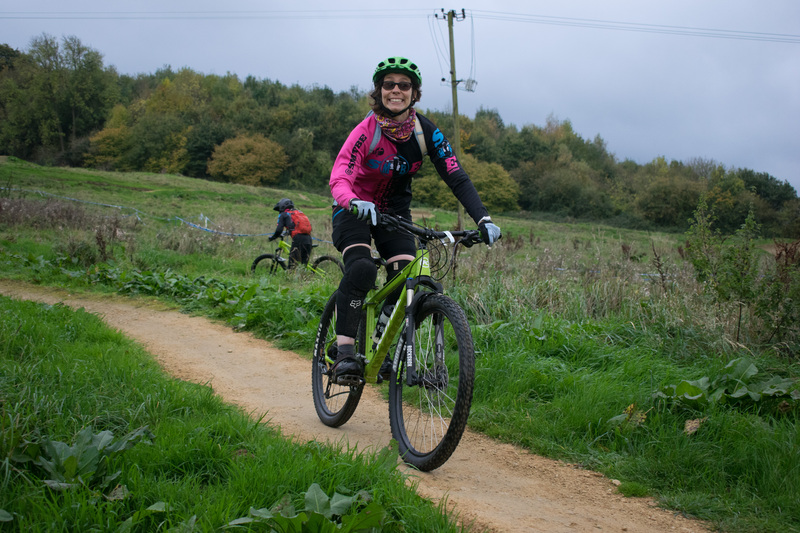 A few more runs and it was 3pm, time for the dual Slalom mates races with the chance of a bottle of Prosecco for the winners of each category. Much whooping, heckling and laughter later the winners were presented with their bubbles, thank you were said and the customary chatting and detail swapping began before everyone gradually trickled off either grabbing one last run or heading home with a tired body but an energised soul. 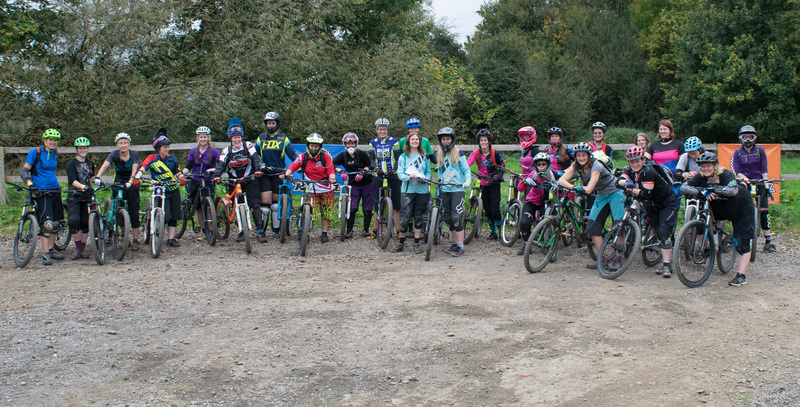 All in all an epic day full of awesome progression for all of our ladies plus another venue ticked off the ridden everywhere list that so many of us aspire to.